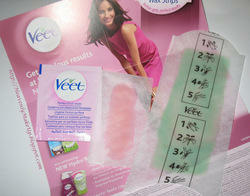 Veet wax strips with Easy Grip for normal skin. Removes hair at the root for up to 4 weeks of smoothness. Wax Strips with Easy Grip Normal Skin Shea Butter and Berry Fragrance. With Veet Wax Strips, you can have instantly exfoliated skin and smoothness that lasts up to four weeks. EasyGrip Wax Strips for sensitive skin. Get instantly exfoliated skin and smoothness that lasts up to four weeks. Find the Veet range of wax strips for easy hair removal at home - the simple way to achieve long-lasting results. Ready-to-Use Wax Strips, you can have instantly smooth skin. Just wax and go! Discover the Veet® range of wax strips for easy hair removal at home. These hair removal products provide lasting salon-quality waxing results at home. Get touchable smooth skin for up to twice as long as shaving with Veet Wax Strip. Long lasting results from Veet - enjoy smooth skin for up to 4 weeks.Contains 20x 2 reuseable wax strips and 4 perfect finish wipes.